What can I say about a man who has written well in talking about parenting? I know that I can say that Mike Berry knows what he's talking about as him and his wife, Kristin, have been parents to eight children through adoption. Through their blog Confessions of an Adoptive Parent he has been able to amass a readership in the tens of thousands in helping other parents. Considering I am in my forties along with my wife of ten years we ought to be parents ourselves, but we're unable to have any children, but then again I feel I digress. With all of that said, I feel I can say that Mike Berry's book Winning the Heart of Your Child has a great tone and feel to it. 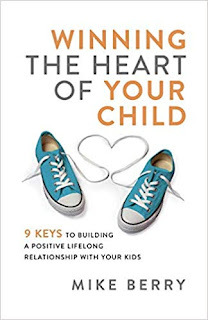 Within the pages of the book, which I refuse to spoil completely, you can expect to find advice on how to better understand and to effectively win your child's heart. Another part of what I can say he's done well with this book is that he sounds like Alex Kendrick playing a father and fellow law enforcement officer from Courageous: "I don't want to be a good enough father. I want to be the best father I can be to my children!" Finally, the last thing that comes to mind is what the Bible says about being an effective parent. Paul wrote the words, "Children, obey your parents in the Lord, for this is right. “Honor your father and mother,” which is the first commandment with promise: “that it may be well with you and you may live long on the earth.” And you, fathers, do not provoke your children to wrath, but bring them up in the training and admonition of the Lord" (Ephesians 6:1-4, New King James, italics for emphasis). As I come from the upbringing of a father who not only served in the armed forces, but loved his children as best he could I can say that one of the worst things a father can do to their children is to frustrate them with shame, guilt, and hardly next to no love. But that's not the case with my own dad. He did his best to show my sister and myself a great deal of love, but he did what he could to raise his children to be honoring of others in this life. I received a complimentary copy of this book from Baker Books for a fair and honest review of the pages within it.